In the Fifties with a rockin' piano Fats Domino came out of New Orleans to become one of rock-and-roll's earliest and best stars. With 65 million record sales to his credit, Fats out sold every Fifties rock and and roll pioneer except Elvis Presley. Fats was born Antoine Domino in 1928 in New Orleans. As a child his brother-in-law Harrison Verett, who was twenty years his senior, taught him to play the piano. Fats, also sang.. The first language he learned to speak was French. He first performed in public at age 10. At fourteen he left school and worked days in a factory so he could perform at local nightclubs. He continued with music into the 40's and was heard by Dave Bartholomew, who would become his writing partner on many of Fats' hit songs. 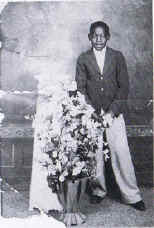 Fats joined the Dave Bartholomew Band in the mid-40's. He was influenced by Albert Ammons and Fats Waller, among others. He signed a contract with Imperial in 1949 and at his first recording session he made sure that he recorded the traditional Hey La Bas. "La Bas" was originally a voodoo god of luck, was identified with St. Peter in French-Catholic Louisiana and finally became La Bas. The record indicated a coming together of many years of New Orleans history and musical influence. It was not, however, his first record to be released. A song about drugs called The Fat Man was cleaned up a bit for his first commercial release, and it reached the R&B chart in 1950. According to some reports, the song was a million seller. The Fat Man also became a nickname for Fats Domino. Another song that made the R&B chart for him, Every Night About This Time, used a piano triplet for which Fats was to become famous. It showed how his music had been influenced by that of Little Willie Littlefield. Fats had another R&B hit with "Goin' Home" in 1952. Fats Domino exploded onto the rock-and-roll scene in 1955 when his song, "Ain't That A Shame," was covered by white recording artist Pat Boone. Boone's version went to number one, and Domino's version on Imperial went to number ten. The song established both artists as stars. Fats could be heard in the background on the records of other artists, such as Joe Turner and Lloyd Price. He continued to write songs with Dave Bartholomew, many of which became hits. In 1956 he put five songs in the top forty, including "I'm In Love Again" and Fats' rendition of a song that had reached number one for Glenn Miller in 1940, "Blueberry Hill". The latter went to number two and was Domino's highest charting record ever. Just like a ride in a pneumatic elevator or rocket, Fats Domino was on on his way up in the rock-and-roll scene fast. Fats Domino was very popular. In 1957 he appeared in a movie that many consider to be the best rock-and-roll film ever made, The Girl Can't Help It, singing his hit "Blue Monday." Another Fats Domino hit, "I'm Walkin'," was covered by Ricky Nelson in 1957 and helped to launch the teenage singing sensation's career. Other top ten songs followed in the late 50's for Domino: "Whole Lotta Loving," " I Want To Walk You Home," and "Be My Guest". The last song had a curious origin -- a teenager had been told by his father to get a job or get out of the house, so he wrote "Be My Guest" and waited in line for a chance to pass it on to Fats Domino. He was able to do so, and heard from Domino's agent some time later; thus was begun the songwriting career of Tommy Boyce. 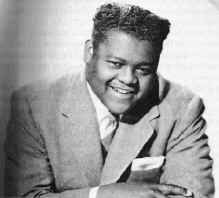 Fats Domino had his final top ten song in 1960 with Walking To New Orleans. He recorded some old Hank Williams songs such as "Jambalaya [On The Bayou]" and "You Win Again" and he did old standards such as "Red Sails In The Sunset," which was his final top forty song, in 1963. In 1968, he even did a cover of the Beatles' "Lady Madonna". He also made some more films along the way, including Shake, Rattle and Roll, The Big Beat, and Jamboree. Fats played Las Vegas frequently, and at the Royal Festival Hall in London in the 80's. He had to leave a tour of Great Britain in the 90's due to health problems. Fats Domino still lives in New Orleans with his wife Rosemary, with whom he has had eight children. His awards have been many, including Grammy's Lifetime Achievement and Hall Of Fame Awards.